Did you know that your gift of just $25 can provide a shower seat for a disabled senior? Or that only $50 can prevent a fall by installing grab bars in a shower? Give today to help low-income seniors, veterans, and families lead safe, independent, comfortable lives. 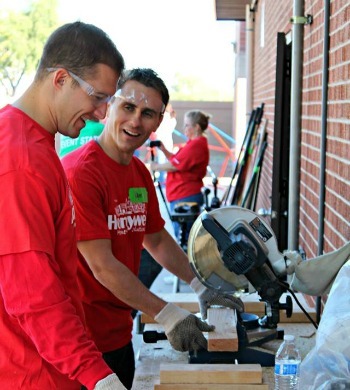 Did you know that many companies offer employees a matching gift benefit that doubles – or even triples – your contribution to Rebuilding Together Valley of the Sun? Matching gifts are an easy way to make a big difference to our ability to serve communities in Arizona. Ask your employer about matching your gift to RTVOS today! Become a regular partner by giving monthly. When you join The Ladder Society, our monthly giving program, you can select monthly checking or savings account deductions or monthly credit card deductions. Email us to learn more!! Including RTVOS in your final giving plans allows you to enjoy the benefits of a gift to charity while making a powerful statement about your love of community. Please Email us to learn more. What better way to honor someone than by helping our community? 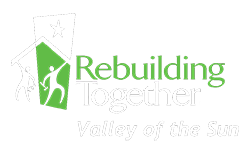 Consider donating to Rebuilding Together Valley of the Sun in honor or in memory of a loved one. Your gift becomes so much more when it worked to help keep our fellow Arizonans safe at home. For helping a less-fortunate neighbor, you deserve some credit, including an Arizona Tax Credit! Get more information about the Arizona State Tax Credit.